Many of you know Indy Magnoli for the incredible Indiana Jones replicas he makes, but how many of you are aware he is also an incredible tailor who offers VERY high end replica suits from famous movies? I myself didn\'t until I had heard through the James Bond grapevine that he was in the process of replicating the famous Sean Connery James Bond suit worn in Goldfinger....you know the one, the iconic three piece suit that has been seen in so many movies after Goldfinger. After very little trepidation (Magnoli\'s reputation is sterling) I ordered the bespoke suit giving him the same measurements as a Saville Row tailor would ask for. Four weeks later I had the suit in hand. I must admit for the money I had expected a \"costume\" suit, that is to say a suit I could not wear in public because it might be unconstructed or fragile. Well, I am happily surprised to say that this now rates among my best suits I own! Beautifully constructed, perfect lines, and most of all faithful to the original---it will be hard NOT to wear this suit. The color, fit and details were expertly done. The only change I would make is not to have belt loops as the original did not (Magnoli is already changing this for future suits proving he LISTENS to his customers). 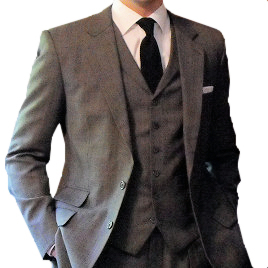 I can\'t recommend this suit and the service that Magnoli provided through this process enough.